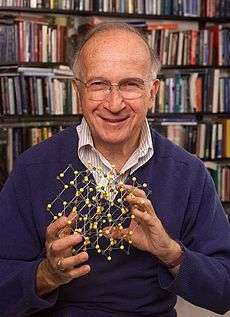 Roald Hoffmann (born Roald Safran; July 18, 1937) is an American theoretical chemist who won the 1981 Nobel Prize in Chemistry. He has also published plays and poetry. He is the Frank H. T. Rhodes Professor of Humane Letters, Emeritus, at Cornell University, in Ithaca, New York. Hoffmann was born in Złoczów, Poland (now Ukraine), to a Jewish family, and was named in honor of the Norwegian explorer Roald Amundsen. His parents were Clara (Rosen), a teacher, and Hillel Safran, a civil engineer. After Germany invaded Poland and occupied the town, his family was placed in a labor camp where his father, who was familiar with much of the local infrastructure, was a valued prisoner. As the situation grew more dangerous, with prisoners being transferred to liquidation camps, the family bribed guards to allow an escape and arranged with a Ukrainian neighbor named Mykola Dyuk for Hoffmann, his mother, two uncles and an aunt to hide in the attic and a storeroom of the local schoolhouse, where they remained for eighteen months, from January 1943 to June 1944, while Hoffmann was aged 5 to 7. His father remained at the labor camp, but was able to occasionally visit, until he was tortured and killed by the Germans for his involvement in a plot to arm the camp prisoners. When she received the news, his mother attempted to contain her sorrow by writing down her feelings in a notebook her husband had been using to take notes on a relativity textbook he had been reading. While in hiding his mother kept Hoffmann entertained by teaching him to read and having him memorize geography from textbooks stored in the attic, then quizzing him on it. He referred to the experience as having been enveloped in a cocoon of love. Most of the rest of the family perished in the Holocaust, though one grandmother and a few others survived. They migrated to the United States on the troop carrier Ernie Pyle in 1949. Hoffmann married Eva Börjesson in 1960. They have two children, Hillel Jan and Ingrid Helena. Hoffmann visited Zolochiv with his adult son (by then a parent of a five-year-old) in 2006 and found that the attic where he had hidden was still intact, but the storeroom had been incorporated, ironically enough, into a chemistry classroom. In 2009, a monument to Holocaust victims was built in Zolochiv on Hoffmann's initiative. He is an atheist. Hoffmann graduated in 1955 from New York City's Stuyvesant High School, where he won a Westinghouse science scholarship. He received his bachelor of arts degree at Columbia University (Columbia College) in 1958. He earned his master of arts degree in 1960 from Harvard University. He earned his doctor of philosophy degree from Harvard University while working under joint supervision of Martin Gouterman and subsequent 1976 Nobel Prize in Chemistry winner William N. Lipscomb, Jr. Hoffman worked on the molecular orbital theory of polyhedral molecules. Under Lipscomb's direction the Extended Hückel method was developed by Lawrence Lohr and by Roald Hoffmann. This method was later extended by Hoffmann. He went to Cornell in 1965 and has remained there, becoming professor emeritus. Hoffmann is interested in the electronic structure of stable and unstable molecules, and in the study of transition states in reactions. He has investigated the structure and reactivity of both organic and inorganic molecules, and examined problems in organo-metallic and solid-state chemistry. Hoffman has developed semiempirical and nonempirical computational tools and methods such as the extended Hückel method for determining molecular orbitals, which he proposed in 1963. With Robert Burns Woodward he developed rules for elucidating reaction mechanisms (the Woodward–Hoffmann rules). They realized that chemical transformations could be approximately predicted from subtle symmetries and asymmetries in the electron "orbitals" of complex molecules. Their rules predict differing outcomes, such as the types of products that will be formed when two compounds are activated by heat compared with those produced under activation by light. For this work Hoffmann received the 1981 Nobel Prize in chemistry, sharing it with Japanese chemist Kenichi Fukui, who had independently resolved similar issues. (Woodward was not included in the prize, which is given only to living persons.) In his Nobel Lecture, Hoffmann introduced the isolobal analogy for predicting the bonding properties of organometallic compounds. Some of Hoffman's most recent work, with Neil Ashcroft and Vanessa Labet, examines bonding in matter under extreme high pressure. "What gives me the greatest joy in this work? That as we tease apart what goes on in hydrogen under pressures such as those that one finds at the center of the earth, two explanations subtly contend with each other... [physical and chemical] ... Hydrogen under extreme pressure is doing just what an inorganic molecule at 1 atmosphere does!" Hoffmann is the co-host of the Annenberg/CPB educational series, The World of Chemistry, with Don Showalter. Since the spring of 2001, Hoffmann has been the host of the monthly series Entertaining Science at New York City's Cornelia Street Cafe, which explores the juncture between the arts and science. He has published books on the connections between art and science: Roald Hoffmann on the Philosophy, Art, and Science of Chemistry and Beyond the Finite: The Sublime in Art and Science. Hoffmann is also a writer of poetry. His collections include The Metamict State (1987, ISBN 0-8130-0869-7), Gaps and Verges (1990, ISBN 0-8130-0943-X), and Chemistry Imagined, co-produced with artist Vivian Torrence. Hoffmann and Brian Alan produced an English cover of Wei Wei's song "Dedication of Love", part of an international music project raising funds to help the victims of the 2008 Sichuan earthquake. In 1981, Hoffmann received the Nobel Prize in Chemistry, which he shared with Kenichi Fukui "for their theories, developed independently, concerning the course of chemical reactions". Hoffmann has won many other awards, and is the recipient of more than 25 honorary degrees. Award of the International Academy of Quantum Molecular Science, 1970, "pour sa methode de calcul des fonctions d'onde moleculaires et pour ses etudes theoriques des reactions chimiques"
Hoffmann is a member of the International Academy of Quantum Molecular Science  and the Board of Sponsors of The Bulletin of the Atomic Scientists. In August 2007, the American Chemical Society held a symposium at its biannual national meeting to honor Hoffmann's 70th birthday. 1 2 "Professor Roald Hoffmann ForMemRS". London: Royal Society. Archived from the original on 2015-11-09. ↑ Hoffman, J. (2011). "Q&A: Chemical connector Roald Hoffmann talks about language, ethics and the sublime". Nature. 480 (7376): 179. doi:10.1038/480179a. ↑ "Roald Hoffmann". HowStuffWorks. Retrieved October 4, 2013. ↑ The Long Ukrainian Winters featuring Roald Hoffman, lecture at the World Science Festival. ↑ The Tense Middle by Roald Hoffmann, story on NPR. Retrieved September 29, 2006. 1 2 3 4 Hoffmann, Roald (2012). "Passerelles". Chemical Heritage Magazine. 30 (2): 37. Retrieved 20 March 2015. 1 2 "Roald Hoffmann - Biographical". Nobel Prize. Retrieved 20 March 2015. ↑ Liberato Cardellini: "A final and more personal question: You defined yourself as “an atheist who is moved by religion”. Looking at the tenor of your life and the many goals you have achieved, one wonders where your inner force comes from." Roald Hoffmann: "The atheism and the respect for religion come form the same source. I observe that in every culture on Earth, absolutely every one, human beings have constructed religious systems. There is a need in us to try to understand,to see that there is something that unites us spiritually. So scientists who do not respect religion fail in their most basic task—observation. Human beings need the spiritual. The same observation reveals to me a multitude of religious constructions—gods of nature, spirits, the great monotheistic religions. It seems to me there can’t be a God or gods; there are just manifestations of a human-constructed spirituality." Liberato Cardellini, Looking for Connections: An Interview with Roald Hoffmann, page 1634. 1 2 Cardellini, Liberato (2007). "Looking for Connections: An Interview with Roald Hoffmann" (PDF). Journal of Chemical Education. 84 (10): 1631–1635. doi:10.1021/ed084p1631. Retrieved 3 April 2015. ↑ "Roald Hoffmann's land between chemistry, poetry and philosophy". Retrieved October 31, 2007. 1 2 Hoffmann, R.; Lipscomb, W. N. (1962). "Theory of Polyhedral Molecules. III. Population Analyses and Reactivities for the Carboranes". The Journal of Chemical Physics. 36 (12): 3489. doi:10.1063/1.1732484. 1 2 3 Hoffmann, R.; Lipscomb, W. N. (1962). "Theory of Polyhedral Molecules. I. Physical Factorizations of the Secular Equation". The Journal of Chemical Physics. 36 (8): 2179. doi:10.1063/1.1732849. 1 2 Hoffmann, R.; Lipscomb, W. N. (1962). "Boron Hydrides: LCAO—MO and Resonance Studies". The Journal of Chemical Physics. 37 (12): 2872. doi:10.1063/1.1733113. 1 2 Hoffmann, R.; Lipscomb, W. N. (1962). "Sequential Substitution Reactions on B10H10−2 and B12H12−2". The Journal of Chemical Physics. 37 (3): 520. Bibcode:1962JChPh..37..520H. doi:10.1063/1.1701367. 1 2 Hoffmann, R.; Lipscomb, W. N. (1963). "Intramolecular Isomerization and Transformations in Carboranes and Substituted Polyhedral Molecules" (PDF). Inorganic Chemistry. 2: 231–232. doi:10.1021/ic50005a066. 1 2 Lipscomb WN. Boron Hydrides, W. A. Benjamin Inc., New York, 1963, Chapter 3. 1 2 Hoffmann, R. (1963). "An Extended Hückel Theory. I. Hydrocarbons". The Journal of Chemical Physics. 39 (6): 1397. Bibcode:1963JChPh..39.1397H. doi:10.1063/1.1734456. 1 2 3 Browne, Malcolm W. (July 6, 1993). "SCIENTIST AT WORK: Roald Hoffmann; Seeking Beauty In Atoms". New York Times. Retrieved 20 March 2015. ↑ "Robert Burns Woodward". Chemical Heritage Foundation. Retrieved 20 March 2015. ↑ Buckingham, A. D.; Nakatsuji, H. (2001). "Kenichi Fukui. 4 October 1918 -- 9 January 1998: Elected F.R.S. 1989". Biographical Memoirs of Fellows of the Royal Society. 47: 223–237. doi:10.1098/rsbm.2001.0013. 1 2 3 The Nobel Prize in Chemistry 1981. Nobelprize.org. Retrieved on April 2, 2014. ↑ Hoffmann, Roald. "Building bridges between inorganic and organic chemistry - Nobel lecture, 8 December 1981" (PDF). Nobel Prize. Retrieved 20 March 2015. ↑ "A Brief History". The Cornelia Street Café. Retrieved March 22, 2013. 1 2 Romanska, Magda (June 14, 2014). "Between Art and Science: A Conversation with Roald Hoffmann". Cosmopolitan Review. Retrieved 20 March 2015. ↑ Amato, Ivan (August 21, 2007). "Roald Hoffmann: Chemist And Poet". Chemical & Engineering News. Retrieved 20 March 2015. ↑ "25 years ago: Roald Hoffmann publishes his poetry". Chemistry World. Energy Science Technology. 28 February 2013. Retrieved 20 March 2015. 1 2 King, Julia (December 11, 1989). "Nobelist Roald Hoffmann: Chemist, Poet, Above All A Teacher". The Scientist. Retrieved 20 March 2015. ↑ BoA sings for Sichuan's Earthquake ! « BoA’s Jewelry Box. Boamyjewel.wordpress.com. June 7, 2008. 1 2 3 "Roald Hoffmann". NNDB Tracking the Entire World. Retrieved 3 April 2015. ↑ Ziabari, Kourosh (12 October 2012). 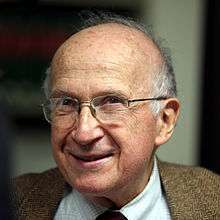 "I Heard On Radio That I Was Awarded The Nobel Prize : Prof. Roald Hoffmann". Counter Currents. ↑ "ACS Award in Pure Chemistry". ACS Chemistry for Life. American Chemical Society. Retrieved 3 April 2015. ↑ "Award Winners". International Academy of Quantum Molecular Sciences. Retrieved 3 April 2015. ↑ "Professor Roald Hoffmann". American Academy of Arts & Sciences. Retrieved 3 April 2015. ↑ "Arthur C. Cope Award". ACS Chemistry for Life. American Chemical Society. Retrieved 3 April 2015. ↑ "ACS Award in Inorganic Chemistry". ACS Chemistry for Life. American Chemical Society. Retrieved 3 April 2015. ↑ "Print National Medal of Science Winners". Alfred P. Sloan Foundation. Retrieved 3 April 2015. ↑ "Roald Hoffmann (1937– )". National Medal of Science 50th Anniversary. National Science Foundation. Retrieved 3 April 2015. ↑ "Foreign Members". The Royal Society. Retrieved 3 April 2015. ↑ "Roald Hoffmann". Kungl. Vetenskapsakademien. Royal Swedish Academy of Sciences. Retrieved 3 April 2015. ↑ "GSAS Centennial Medalists". Graduate School of Arts and Sciences. Harvard University. Retrieved 3 April 2015. ↑ Hoffmann, Roald (September 1996). "Teach to Search: ACS 1996 Pimentel Award". Journal of Chemical Education. 73 (9): A202. doi:10.1021/ed073pA202. Retrieved 3 April 2015. ↑ Abrahams, Sidney. "Elizabeth Armstrong Wood (1912-2006)". Retrieved 11 November 2015. ↑ Koch, Wolfram. "Theaterdonner auf dem Chemiker-Kongress". 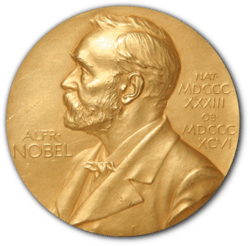 ↑ "Kolos Medal Laureates". Warsaw University. Faculty of Chemistry. Retrieved 3 April 2015. ↑ "American Institute of Chemists Gold Medal". Chemical Heritage Foundation. Retrieved 3 April 2015. ↑ "Chemist and writer Roald Hoffmann wins Grady-Stack Award for science journalism". ACS Chemistry for Life. American Chemical Society. Retrieved March 22, 2009. ↑ "ACS Fellows". ACS Chemistry for Life. American Chemical Society. Retrieved 3 April 2015. ↑ "Roald Hoffmann". International Academy of Quantum Molecular Sciences. Retrieved 3 April 2015. ↑ "Board of Sponsors". Bulletin of the Atomic Scientists. Retrieved 3 April 2015. ↑ Kovac, Jeffrey; Weisberg, Michael (2012). Roald Hoffmann on the philosophy, art, and science of chemistry. New York: Oxford University Press. ISBN 9780199755905. Retrieved 3 April 2015.